BACHELOR OF CIRCUS ARTS - The three year full time Bachelor of Circus Arts degree course incorporates intensive physical training with performance opportunities, academic studies, technical production, health and business education. CERT IV IN CIRCUS ARTS - this 1 year full time course provides training in preliminary level circus skills and knowledge. This course is suitable for aspiring circus artists seeking a qualification and as a pathway for further learning. The Certificate IV can be used for preparation for the Bachelor of Circus Arts course. 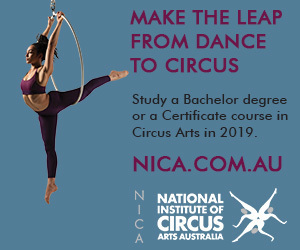 CERT III IN CIRCUS ARTS - offers young people in Year 11 and 12 the opportunity to gain a nationally-recognised qualification in Circus Arts after two years part time. The course provides basic training in contemporary circus arts for students who wish to pursue a career as a circus performer. NICA boasts some of the world’s finest circus and performance practitioners, hailing from Australia, China, England and Russia. They provide students with a grounding in the world’s traditional and contemporary circus styles, and inspire them to excel in and innovate their craft. Together with the school’s dedicated teams of production, health and administration professionals, they produce a unique educational experience for NICA’s students.